Q: Can the Tuff Skinz motor cover be used on my motor while my motor is running? A: YES! – Your Tuff Skinz vented motor cover can be used while your motor is running, and motor will not overheat. 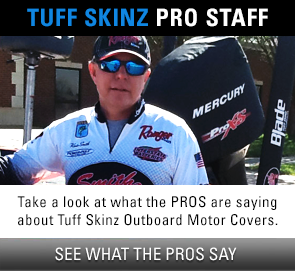 Tuff Skinz Vented Outboard Motor Covers have strategically placed vents for each motor type. Tests have shown that there is more than adequate airflow and covers can be left on at all times. Q: Won’t it come off while traveling across the lake or during towing? A: No, it will not. It has a 1″ strap sewn into the bottom of the cover and a snap buckle in the front. Once it is in place, and the buckle is secured, the end of the strap can be pulled to allow the bottom to be drawn together, making the cover impossible to come off, while towing, or on the lake. Q: What makes Tuff Skinz different from other covers? A: Our covers are the only covers MADE IN THE USA. Our covers are NOT “one-size-fits-all” — we make covers specifically for your motor make and year. We have the BEST warranty in the business. (see below). Our covers are the ORIGINAL, vented covers. Q: How can I find out the year my motor was made? Take a look at this diagram. 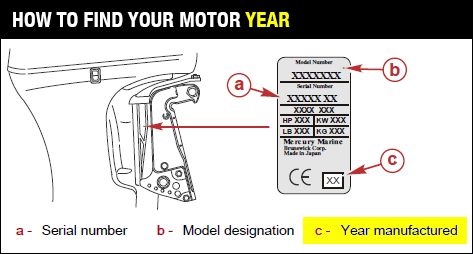 Look for the tag on your motor and look for the two numbers in the small box (C). Q: What are Tuff Skinz covers made of? A: Our covers are made from a tough marine-grade acrylic coated woven polyester fabric that is treated with UV and water repellent chemicals. They are NOT made with Neoprene as Neoprene fades fast, loses elasticity and drys out. The white underside is a soft, felt-like, non-woven, non-abrasive 100% polyester backing. Our covers are resistant to mildew, abrasions, water penetration, most petroleum products, UV rays, and a wide range of acidic and alkaline liquids — within reason. Q: What graphics or logos can I put on my cover? A. 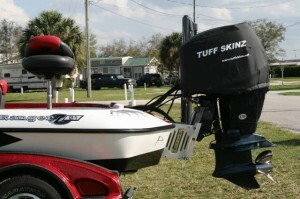 You can put just about anything on a Tuff Skinz cover: your logo, guide service logo, company logo, clever sayings, etc. And in any color as well. We can even match your boats color scheme. We have reproductions of all factory cowling graphics and can even recolor those! However, we can not add YAMAHA to any of our covers – they are the only manufacturer that will not allow it (well, that and Skeeter). All other logos like Mercury, Evinrude, Suzuki, Honda, etc. we can put on a cover. We also have metallic, neon and even “sparkly” colors to use for basic/simple graphics or words – just let us know what your looking for. Q: Can I get a Tuff Skinz cover in a different color? A: We currently offer our motor covers in Black, Charcoal Grey, Silver Grey and White. We can make them in popular Camo patterns, and we can make them in many OTHER colors, but not in ANY color — so just check with us first at 877-99-COVER (877-992-6837). Q: What is the warranty of the Tuff Skinz? The craftsmanship of Tuff Skinz covers is guaranteed for a period of five (5) years from the date of original installation against the separation of stitching used to assemble the Tuff Skinz cover. 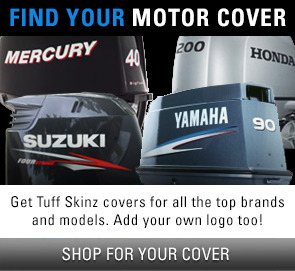 In the unlikely event of failure of the fabric, graphics, or craftsmanship during the three year period, Tuff Skinz will at its option, supply the original purchaser of the motor cover, a replacement cover and Tuff Skinz will ship to the purchaser at the original purchaser’s expense. This warranty protects you against damage to covers used under normal conditions. It does not cover damage from Acts of God, vandalism, neglect or use or care not in accordance with Tuff Skinz use and care instructions. This warranty is in lieu of all warranties expressed or implied and Tuff Skinz will not be liable for any consequential or incidental damage. Any implied warranties imposed by law are limited in time to the duration of the expressed warranty. Q: Do Tuff Skinz have a portal in the cover to allow access to the trim switch? A: We have found that more places on the cover that limbs and branches can penetrate, the more they will hang up. However, due to popular demand and angler complaints, our most popular model covers do have cutouts for the trim switches. The old “darned if we do, darned if we don’t” saying applies here. Q: How much coverage will I get from my Tuff Skinz? A: The Tuff Skinz is designed for maximum protection. It is designed to cover the upper cowling and most of the lower cowling except for the upper and lower shaft, and part of the lower cowling that is closest to the water. Q: How easy is the Tuff Skinz to clean? A: It is very easy to keep clean using a mild detergent such as Simple Green, water, and a sponge or scrub brush. Taking it to a car wash and spraying it should be fine. Clean with a cleaning solution of 2 ounces of mild soap (dishsoap) mixed in one gallon of warm (100⁰ F) water. Do not use harsh detergents. Use a soft, bristled brush to lift soil embedded in the fabric surface. Rinse thoroughly with clear water to remove soil and soap residue. If underside gets wet, please allow to dry completely. Do not use paper towels. Do not toss it in your washing machine. Lot’s of washing or use of harsh chemicals or detergents can remove the protective coatings and will render the fabric susceptible to UV rays and the elements. After a few washings you’ll need to replenish the protective coating on the cover. 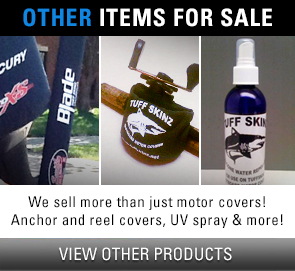 We sell Tuff Stuff Protectant you can use if you like. After washing, simply spray it on then wipe it off with a clean rag. One bottle lasts for several treatments and product has no shelf life.